I had in mind to do this very tidy photo progression as a sort of drawing lesson and whatnot, but it got a little disorganized. Sometimes I think if you could see my brain it must look like one of those Escher prints where things are right side up and sideways and upside down but still strangely connected. Or like the staircases in Hogwarts that change around all the time. 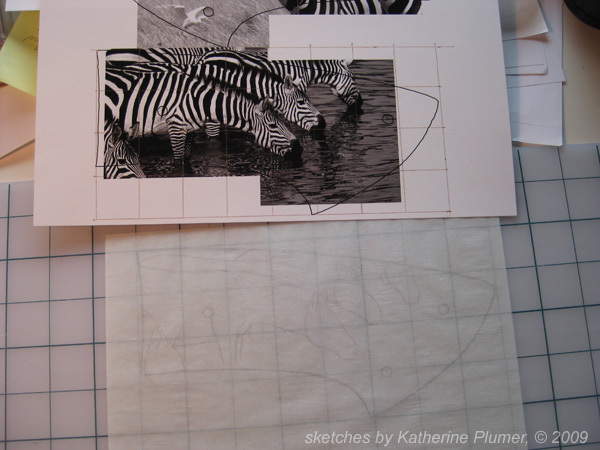 I've pretty much come full circle with this zebra thing. 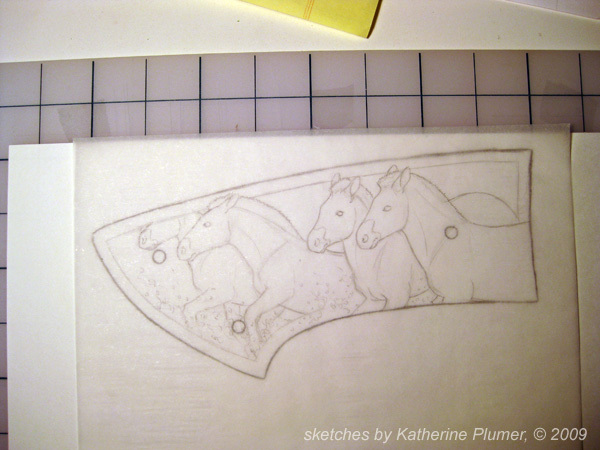 It started as a design for only the front side of the knife. Then I wanted a simple image on the back. Then I came up with two really "wowzer" images, one for the front and one for the back. 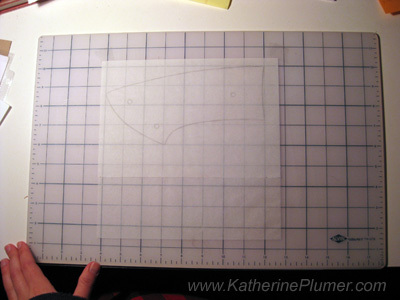 Then I realized that's overkill (that and Don C. told me it wouldn't really up the selling price that much to do that). 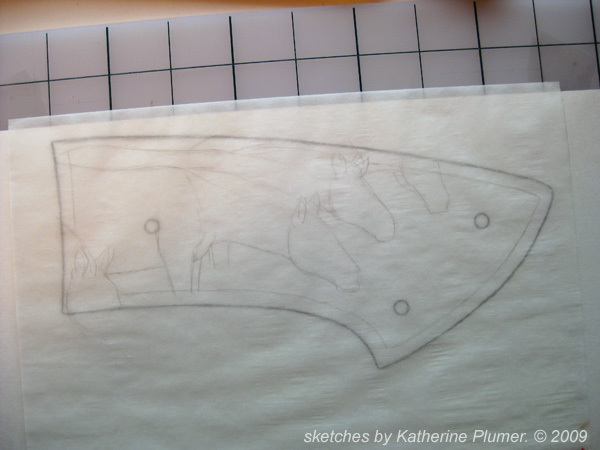 And besides, the "back" image is cool enough to be a front on some other knife. Don't put your good stuff on the B-side, right? So then I went back to thinking maybe something simple on the back. Or maybe nothing. Either is okay, really. It'll come down to time. I have two MAJOR projects due in early to mid May (this knife and a set of pistol grips) and each one deserves my full attention. If that means not doing the backside of the knife, that's okay. So, while I sit here right now going tappity tap on the keyboard I'm not sure where this blog is going but I'll show you a bunch of pics and try to say something moderately intelligent and maybe when I'm done it'll make some sense and might even mean something to someone. Learn your subject. Understand your subject. Study it if you have to. Know it from the inside out. Understand the structure and how parts go together and move. When I draw chickens, I start a sketch by drawing (this is going to sound weird) but basically a carcass. You know, drumsticks and little wings all folded up. Mmm, I'll have to show this to you some time. It's just that if I can get the "underparts" correct, I can get the feathers in the right spot. 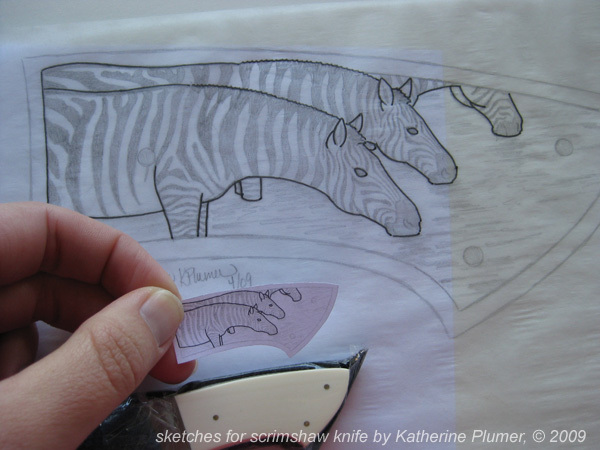 A familiarity with horses is definitely a bonus in this zebra project, but they are definitely NOT striped horses in terms of their conformation! Okay, so as I said in an earlier post, I like to figure out compositions in Photoshop. 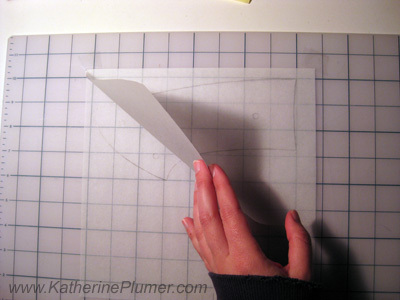 I can easily move my reference material around until I figure out what works. 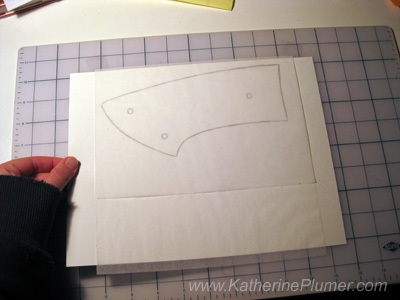 (In the olden days I'd do a bunch of "thumbnail" drawings, and sometimes still do, but this is a timesaver, and we all know time is money... or so they tell me). Ah, where to find photos! Man, I remember trying to find reference material back in the days before internet. It was... a pain in the asterisk to say the least. I'm rambling. Time to throw in some photos. This is a hodge podge of pics from both sketches, but I'll try to make some sense of it. 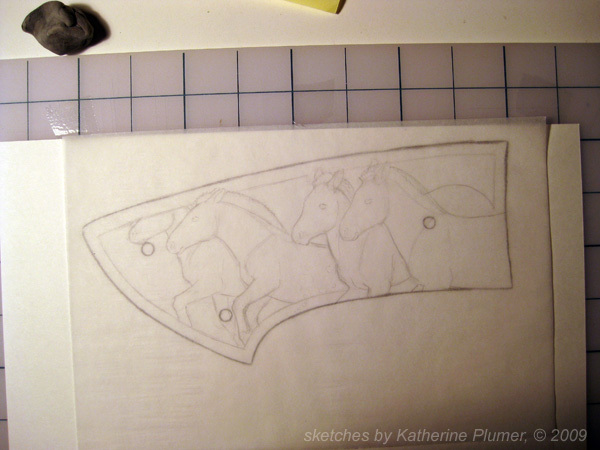 This is actually the sketch for what was going to be on the back of the knife (and now likely won't be on this knife at all, but that's okay, I can use it elsewhere). First I've just got the basic shapes kinda roughed in, and the I add a little more detail, and then when I'm sure that's all good I go over it again to really solidify everything. 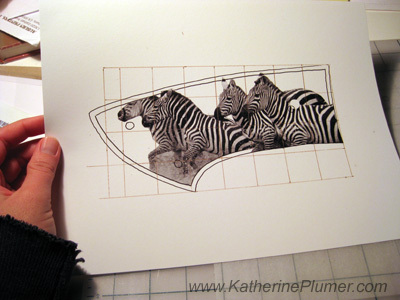 I like this image quite a bit with the zebras splashing through the water. 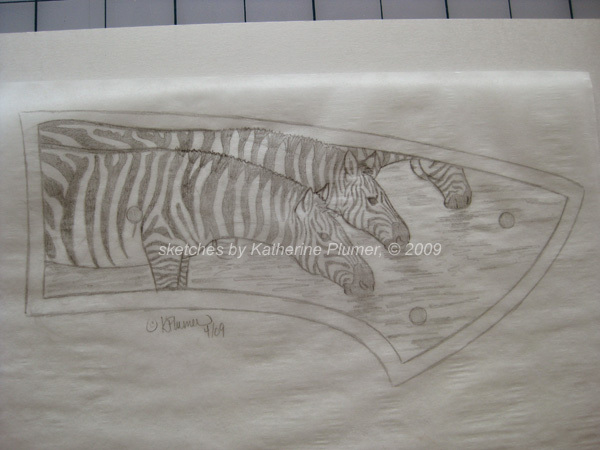 I did not get around to adding their stripes, because somewhere around here I was thinking I wouldn't be using this. 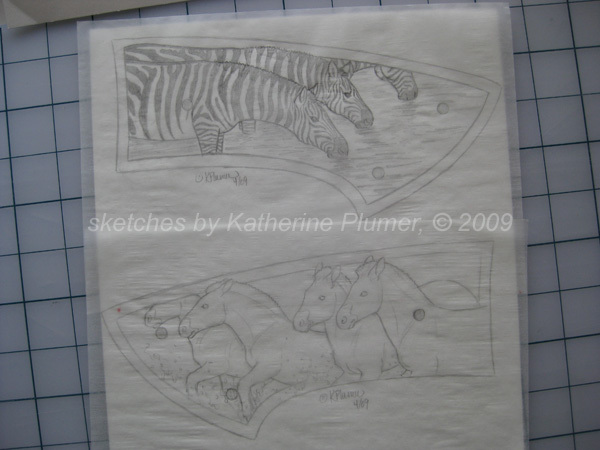 Here's the reference pic for side 1 with a roughed sketch. Again, not a slave to the grid. La la la, got all absorbed in it and forgot to take pictures until I finished, and somewhere along the way I removed the foreground zebra head that was in the previous pic. 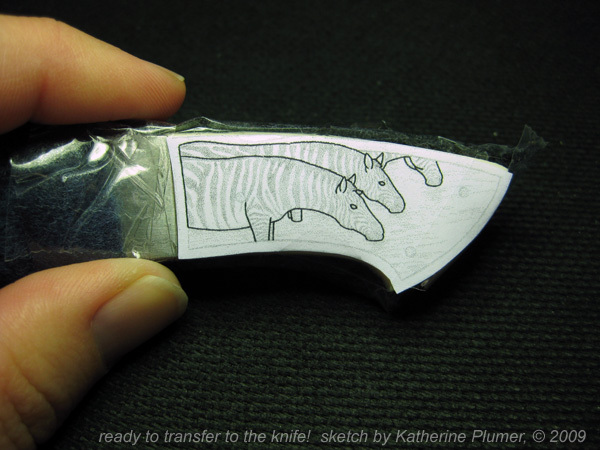 If I'm NOT using the other image on this knife, I don't need to put 4 zebras on the front. I like 3 better anyway. Both sides together. 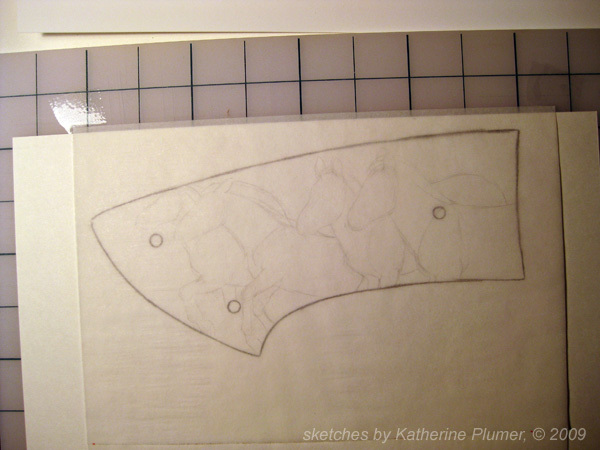 They're very neato together, but either will stand alone and it's water ripples that actually got me thinking along these lines anyway, that will go great with the damascus blade, and that's why I'm using the image that I'm using. 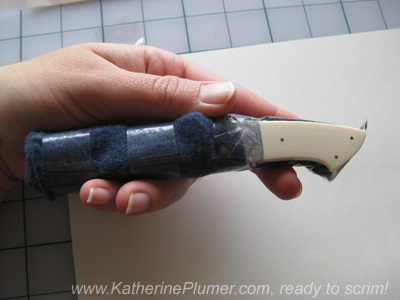 The knife is "muzzled" (as my mom said) with felt and tape so that I don't impale myself and also to keep all the parts I'm not working on safe from any accidental scratches. Taped on and ready to transfer! My hands don't really have that green tinge, this was under the fluorescent microscope light, it always makes things look green in the pics. That's all for today, this is WAY LONG anyway. I was worried about the brads that hold the knife handle on. Not only did you nullify their distractions...you actually brought them into the focal point . I am impressed! This will be a fine piece of work. Thanks Aaron! I'm not too worried about them since they're small, and the over-all image will be pretty dark so I think they're going to blend right in!